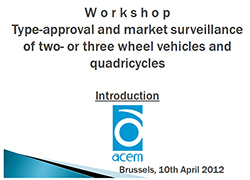 On the 10th of April ACEM, the European Motorcycle Industry Association, invited officials from all European Ministries of Transport for an informal exchange of views on the regulation on the type-approval and market surveillance of two- or three-wheel vehicles and quadricycles (COM 2010/542). Given the complexity of the proposed legislation and the impending deadline for its application (1.1.2014), ACEM called on the Members of the Technical Working Party of the European Council for a meeting with the aim of offering an additional opportunity to exchange opinions on many open questions of the regulation currently under discussion. Based on the positive turnout and feedback of the workshop organised in collaboration with the Polish Presidency last September, this event was an opportunity to informally exchange views with industry experts on issues related to the codecision act and the delegated acts. More than forty participants registered for this event showing high interest in the topic. ACEM’s identified the main priorities for the industry, such as the calendar for technical and administrative requirements, and specific environmental issues, (Euro steps, durability, crankcase emissions, evaporative emissions, annexes). Jacques Compagne, reiterating the industry concern about the economic crisis, said that this regulation should be proportionate and cost-effective, while also contributing to strengthen the PTW industry in Europe and abroad. While ACEM supports the EC’s objectives of reducing emissions and improving road safety, it stresses the need to bring this regulation into a greater context, considering the stifling European market conditions as well as the global background. Given the relatively small size of the EU market compared to other global markets, Mr Compagne underlined the need for global technical harmonisation of rules and urged policymakers to avoid creating a unique European regulatory context that would only create type approval inconveniences without helping the industry to compete on more promising markets. The consequence of developing regulations only for the EU, will only lead to additional burden and costs for globally active manufacturers without benefits in terms of competitiveness. Representatives from Italy, Spain, Germany, the Netherlands, Belgium, and the UK attended the workshop. MEPs also responded positively to the invitation, as well as officials from the European Commission and the European Economic and Social Committee. Mr Wim van De Camp MEP and Rapporteur of the Regulation, confirmed the Parliament’s willingness to reach an adequate solution of the most debated issues. Furthermore, Mr van De Camp showed the intention of the Parliament to try to find a compromise on the issue of braking, which a recent Impact Assessment Study commissioned by the IMCO Committee could not clarify. As part of the Commission’s modern industrial policy, the CARS 21 (Competitive Automotive Regulatory System for the 21st century) process, which was initially launched in 2005, aims to make recommendations for the short-, medium-, and long-term public policy and regulatory framework of the European automotive industry. This framework enhances global competitiveness and employment, while sustaining further progress in safety and environmental performance at a price affordable to the consumer. 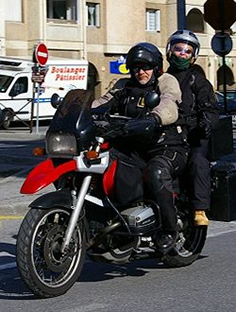 As a participant in CARS 21 ACEM asked to consider placing the Powered Two-Wheeler sector under the concept of moratorium. Antonio Tajani, EU Commissioner for Industry, previously stated that given the enduring crisis of the automotive industry, in order to safeguard manufacturing in the EU, the idea of a moratorium should be taken into consideration. A re-evaluation of certain aspects of the regulation appears therefore necessary. The introduction of some of the requirements should be adjusted and phased-in to prevent PTW manufacturers’ costs from rising immoderately beyond consumer acceptance and contribute to the sustainability of European production plants. What the industry is stating is that if it ain’t broke don’t fix it and it looks like member states are starting to agree with them. If the proposal goes down the swanee, for a couple of things that would be a shame, e.g. labelling CO2 emissions and alignment with the automotive industry on emissions, but for all the rest of the stuff, we don’t think alot of people will lose too much sleep. 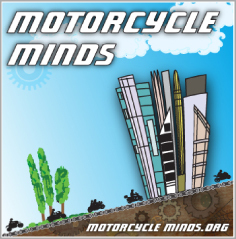 Regarding the Cars 21 Report this is exactly what we wrote to the Commission right at the beginning, the motorcycle industry should be given the same opportunities under the Cars 21 Report as the automotive industry – including a morotorium. We would like to draw your attention to the CARS 21 report (2006). In its report on a Competitive Regulatory Framework for the European Automotive Industry, the CARS 21 High Level Group made recommendations in relation to better regulation in the Automotive Industry. 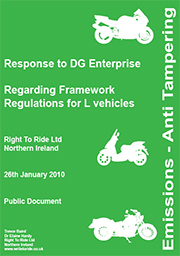 We have identified what we consider to be the most salient points which we would like to refer to the proposals for changes to the framework regulations for L category vehicles. • Generally, the EU should refrain from adopting technical legislation directly affecting the vehicle construction and functioning outside the type approval framework and at the same time consistency of type approval legislations should be improved. • All automotive legislation should be performance-oriented, technology-neutral, and overprescriptive regulations should be avoided. • The principle that regulations should only fix objectives in terms of measurable performances, not solutions, should be strictly respected. If there are exceptions, the criteria to accept them should be given.